BERLIN, MARCH 28, 2019 — Following Prime Minister Nikol Pashinyan’s recent state visit to Germany, the process of intensifying contacts between Yerevan and Berlin continues apace. 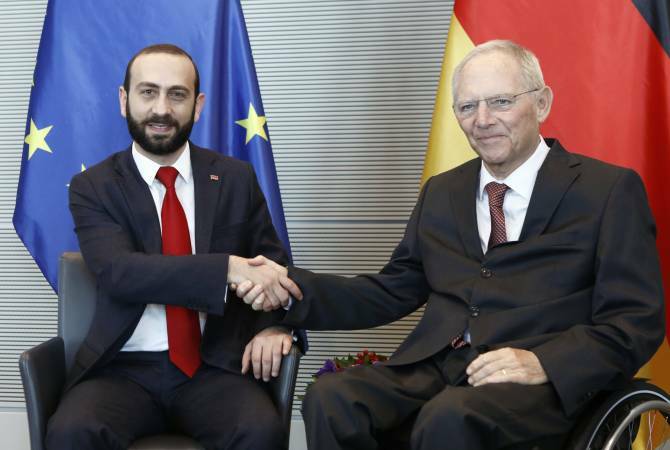 On the invitation of German Federal President Frank-Walter Steinmeier, the President of the Armenian Parliament Ararat Mirzoyan began a five-day visit to Germany on March 17. In the capital he was received by the President of the Bundestag (Parliament) Wolfgang Schäuble, and was scheduled to meet with parliamentarians, including Petra Pau, Bundestag Vice-President, and Johannes Kars, head of the German-South Caucasus Friendship Group. His agenda includes discussions with Ralf Wieland, President of the Berlin parliament, Stephan Toscani, President of the Saarland federal state parliament and Parliamentarian Albert Weiler, President of the German-Armenian Forum. The delegation, comprising parliamentarians Ruben Rubinyan, Lilit Makunts, Ednon Marukyan, Naira Zohrabyan and Tsovinar Vardanyan, was invited to visit the German Parliamentary Association (DPG) the German Institute for International and Security Affairs (SWP) and the Saarland University. In his meeting with the leadership of the German-Armenian Forum, Mirzoyan reiterated that it is Armenia’s intention to seek an even more intensive dialogue with Germany, in which the Forum could play a vital role. Forum President Albert Weiler reported on the aims and activities of the relatively young association. The Forum and its members have followed the political upheavals in Armenia with attention, he said, and welcome the reforms that the new government has announced. Cooperation with Armenia should be stimulated by the EU-Armenia Partnership Agreement, he said, adding that the Bundestag would vote on the document in April. “With the Partnership Agreement Armenia has a comprehensive and excellent opportunity to develop cooperation with the EU and to carry out reforms in various fields. Our aim,” Weiler continued, “is to intensify the political and economic partnership and cooperation with Armenia on the basis of our common values and close ties,” and this, he added, includes strengthening participation in European Union policies, programs and agencies. At the conclusion of the meeting, Mirzoyan responded to questions by Forum members. At the event several high-ranking representatives of the city were present, as well as the Primate of the Armenian Church in Germany, Archimandrite Isakhanyan, and the Provost of St. Hedwigs Cathedral, Tobias Przytarski. Forum President Weiler joined Parliament President Mirzoyan in laying a wreath on the memorial stone commemorating the victims of the Armenian genocide.